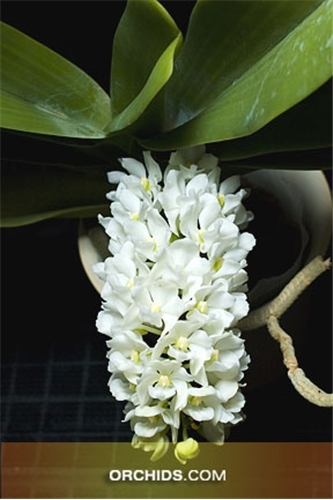 Rhynchostylis gigantea is native to Burma, Indochina, China, Malaysia, Borneo, and the Philippines. Rhynchostylis species are commonly known as the foxtail orchids because of the erect or pendulous inflorescence of densely crowded, small, vibrant flowers. Flowers have a natural spread of up to 2 cm across. The plant is a stout, short stemmed monopodial epiphyte with broad leathery leaves. Delightful Fragrance !